Use the Pythagorean theorem to derive the equation of a circle. 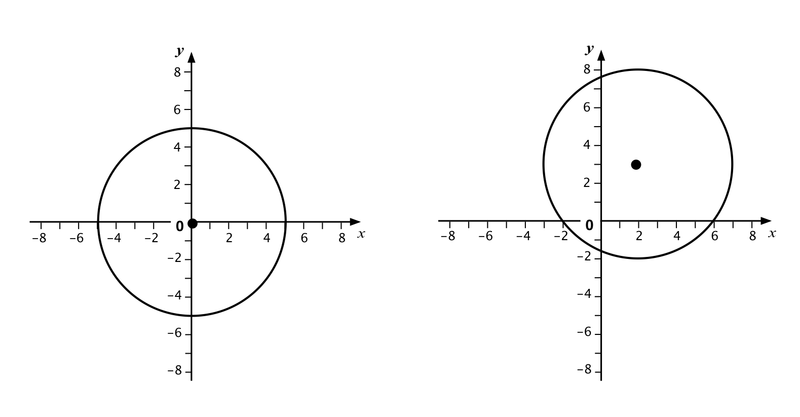 Translate between the geometric features of circles and their equations. Before the lesson, students work individually on an assessment task that is designed to reveal their current understanding and difficulties. You then review their work and create questions for students to answer in order to improve their solutions. After a whole-class introduction students work collaboratively, categorizing equations and geometric descriptions of circles. At the end of the lesson there is a whole-class discussion. In a follow-up lesson, students again work alone on a similar task to the pre-lesson task. Each student will need a copy of the assessment tasks, Going Round in Circles and Going Round in Circles (revisited), a mini-whiteboard, pen, and eraser. Each small group of students will need Card Set: Equations (cut up before the lesson), an enlarged copy of the Categorizing Equations table, a compass, and a glue stick. You may want to copy the Card Set: Equations and the Categorizing Equations table onto transparencies to be used on an overhead projector to support whole-class discussions. 15 minutes before the lesson, a 70-minute lesson (or two shorter lessons), and 15 minutes in a follow-up lesson. Timings are only approximate.